Description: Raymond Pitcairn and Harry Bowman posing with a rough hewn log that is being made into a tie beam. The tie beams span the entire space from one side to the other in the nave. 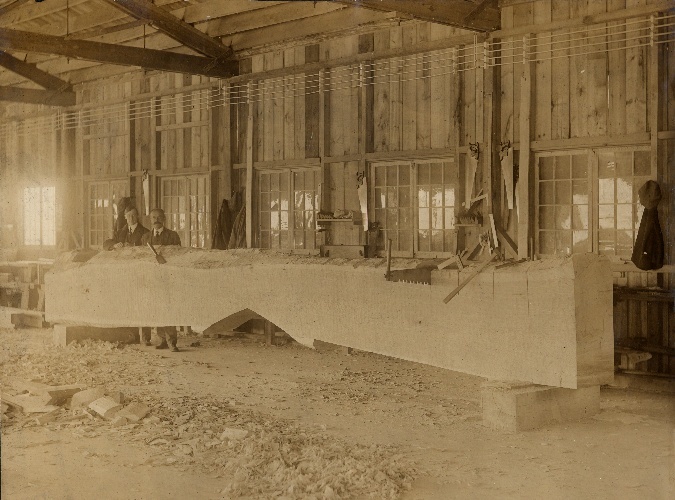 "Harry Bowman, a free lance building superintendent of Swiss ancestry, was chosen in 1914 to be head of the woodworking force at the Cathedral. . .and Bowman remained to become superintendent of the church's building until its essential completion in 1928. A master builder, he combined a rigid sense of honesty with a real love of the work, and gained the respect of all who were associated with him, below as well as above" (Glenn, E. Bruce. Bryn Athyn Cathedral: The Building of a Church. Bryn Athyn: Bryn Athyn Church, 1971. p. 122-123).